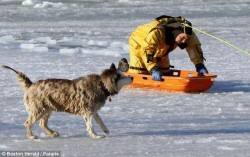 A story of a dog trapped on the ice with the help of Sensei Wong, a fictional character in Anthony Wolff’s novel, Revenge, Recovery and Rescue: The 3R Murders show how cause and effect is not a one to one relationship of laying blame or claiming praise. It’s much more difficult. Find out the straightforward Zen Way of Sensei Wong and get off this slippery spot of praise and blame in “A Dog on the Ice”, by Yao Xiang Shakya.